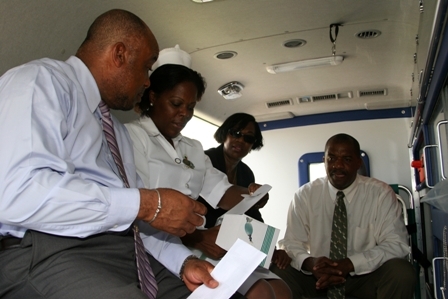 The Alexandra Hospital upped its fleet of ambulances to three on September 11, 2008, when Minister of Health in the Nevis Island Administration (NIA) Hon. Hensley Daniel, handed over the keys to a new fully equipped ambulance, to the institution’s Medical Chief of Staff Dr. Cordell Rawlins. During a brief ceremony to mark the occasion at the institution’s car park, the Health Minister said the NIA had recognised the need to improve on the quality of health care delivery to the people of Nevis, therefore, purchased the fully equipped ambulance with funds from the island’s treasury. “I have heard enough that we need a new ambulance during the two years we have been in government…it has become customary for us to wait to see if we get some good will from somewhere to get an ambulance. an ambulance which is fully equipped and which I am told can begin working tomorrow (Friday). The cost of the ambulance is about $174, 577.52… However, for us in the Ministry of Health, we are simply wanting to ensure that all the critical components of Health care are satisfied. This morning we have an ambulance which is funded fully by the Nevis Island Government treasury” he said. Mr. Daniel used the opportunity to urge persons who would man the ambulance, in particular the drivers, to care for the vehicle and help to expand its lifespan. “I am going to say to the drivers…if you think of the opportunity, cost of capital could be used to do a host of other things and when we invest that [$174, 577.52] in an ambulance, we expect them to take good care of the ambulance. 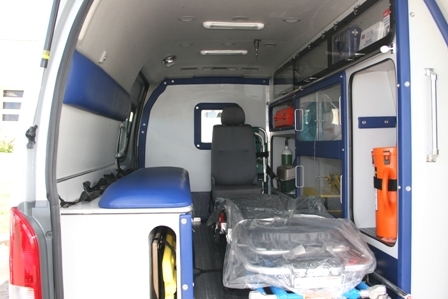 “We also expect our Emergency Medical Service technicians to feel that we are responding to their needs when we say that we provide an ambulance and I want the public also to understand that when there is a situation where there is a challenge with a functional ambulance that the government through the Ministry of Health is also aware of that,” he said. The Minister also expressed the hope, that the people of Nevis saw the purchase of a new and fully outfitted ambulance as the Administration’s move, in its continued efforts, to meet their health care needs. “I believe that the shelf life of an ambulance or the life of an ambulance like this is supposed to be 15 years, so I believe we should get good service for another 10-15 years… I am going to ask that the EMS technicians, the drivers and administrators to please defend the public’s money so that the public will feel that they can have the service when they need it… In the delivery of health care ambulances are key,” he said. Meantime, Dr. Rawlins said he saw the new ambulance as an important step in the delivery of health care at the Alexandra Hospital. “In terms of the improvement of health care it is actually a fantastic step forward to get a new ambulance. Emergency medicine is an integral part of any health care system and this provides us with one more step up the ladder, to providing what we term to be adequate emergency care and adequate health care in Nevis in general,” he said. 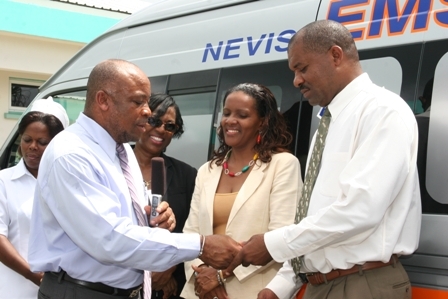 Dr. Rawlings said he was pleased that the new ambulance was not donated but bought by the people of Nevis. He was of the view that it was an indication that the island had come of age. “I am also happy that on this the 25th anniversary of independence we did not beg for this ambulance, it was not donated to us we bought it. It means we [Nevis] are becoming of age,” he said. 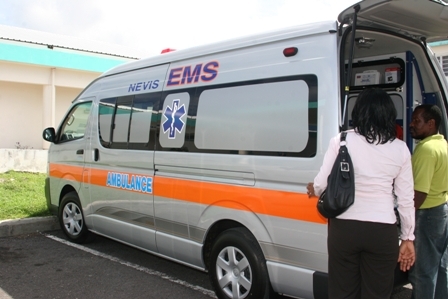 Dr. Rawlins also joined the Health Minister’s call for health personnel to care for the new ambulance and urged the public to report any incidences of abuse to the health authorities. “I am imploring the public if you see this ambulance or any other being operated recklessly, you can give us a call here at the hospital…or you can give the Ministry of Health a call because we really need everyone to look out for the care of the ambulance. “It is our money, it is your money so if you see it being operated in a reckless manner you need to let us know the date and time and we will know who the driver is…I am begging you to help us in that regard,” he said. Also present were Permanent secretary in the Ministry of Health Mrs. Jocelyn Liburd, Hospital Administrator Mrs. Veta Morton, Alexandra Hospital Matron Nurse Aldris Pemberton and Emergency Medical Service Technician Ms. Donna Jeffers. The devotion was done by Mrs. Merna Walters.